I feel a little silly writing about how good the library is. Seems obvious, right? Yet, I hadn’t been to one in years. I didn’t think the library would have anything for me: I mostly read books on my phone, using the Kindle app. And, no, you don’t have to live in San Francisco to get access. Any address in California will do. Even visitors can get access!!! Once you have a barcode number and password, you can get started. 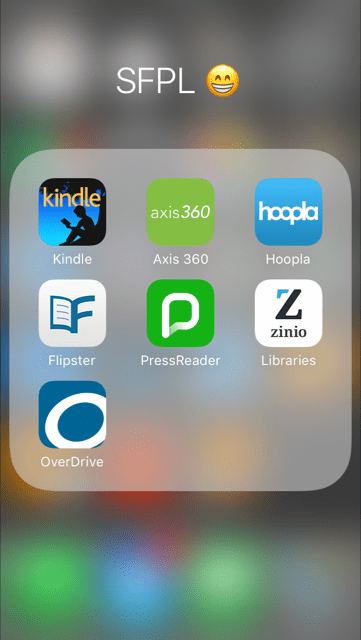 Overdrive, Axis 360 and Hoopla – Each one seems to allow a variety of ways to get to their content, but all a little different. It’s a bit messy, but once you are in each platform, navigation is intuitive. While each platform is self contained, the overall library search (which seems to be a platform powered by Bibliocommons) covers all titles on all platforms. If you search here, it will direct you to the publications on the right platform. Another thing that worked for me: just googling “sfpl” and what I am looking for. It not only seems to show results from the overall library search, it also shows supplemental content the library may have around the author, book or subject. For example, if I wanted to find William Gibson’s “Burning Chrome”, I would search “sfpl burning chrome” – https://www.google.com/search?q=sfpl+burning+chrome. You can download content to A LOT of devices (https://help.overdrive.com/#devices), but that I can download to my Kindle App on my iOS devices makes me the most happy. I didn’t need to download the Overdrive app to my phone to get the book delivered to my Kindle app, which was nice. E-books is where this one really seems to stand out (over 80K titles), and audio books (over 13K), and it seems they are experimenting with videos. Axis 360 offers thousands of E-books and audio books as well, but you need to use their app on a device. While I think their app is good, I prefer the using the Kindle app. That said, it seems that other people do too, so if a title isn’t available on Overdrive, it may be likely on Axis 360! Hoopla offers eBooks, Audiobooks, Music, movies, and TV shows, but I’ve found what really has shown through for me are comics and movies. I’ve always wanted to get into comics, but, for me, the cost and storage always seemed prohibitive. To be able to get free digital comics is a dream come true! I’ve read quite a few already, and I am really loving it. That said, I have a relatively small phone, and find it a challenge to readcomics on that size of screen. But, opening it up on a full size tablet is perfect! I’ve also been really happy with the movies. I have access to a number of streaming services, but find a lot of what the offer to be unappealing filler. The movies on Hoopla seem really well curated, offering quality over quantity. I also find that downloading the videos to be quick and easy, avoiding some of the issues other streaming / download services seem to have. I also really like how they organize books: they have separate categories for audiobooks, ebooks and comics, and then further subdivides into genre. It seems there are number or resources that offer Magazines and Newspapers. One of the tricky aspects of this is to use some of them, you need to start on the SFPL site, and then using their proxy, go to the services’ site. Once you’ve done that digital “touch base”, you have access to the platform. I’ll explain more in detail for each service. I’ve found the selection very good, and really fun to read on my ipad: it’s very much like paging through a magazine. Not so great on my smallish phone’s screen to read the actual page, BUT you can get just the text of the article, which is VERY clear to read. I’ve downloaded several, including The New Yorker, New Scientest, Cooks Illustrated, Newsweek, Bon Appetit, And Wired. I’m also really happy to see kid’s magazines on the service. And I’m still going through the collection! I find Flipster to be a lot like Zinio, but with a different selection of magazines. I haven’t found as many magazines that I like with Flipster, but they do give you access to Consumer Reports, Food & Wine, Time, Scientific America and The Week. They also seem to have a GREAT selection of Adult Coloring Books. Press reader is a MASSIVE trove (over 6000 publications) of newspapers and magazines. That’s over 6000 titles, many of which that are updated daily! That said, I mostly am interested in it because it gets me the San Francisco Chronicle. I really love being able to page through the paper on my ipad. And, like on Zinio, you can click on an article and get the full text. Also, the interface is really slick, but it is hard to work with. You can’t seem to delete what you downloaded! You can select how many back issues to keep, but you can’t delete them directly. There is also a feed of articles. Not exactly sure how that works. There also seems to be a whole bunch of community tools. But, not something I really want to use. You can get unlimited access to The New York Times website for 4 days at a time. It seems you need to go to the SFPL’s site, enter your library card number and password, and then you are sent to the NYT’s site, at which point you have 4 days to access the site. After 4 days, you will need to repeat the process. A small price to pay for access! It seems like you only are able to get access from a browser, not the app. Also, for me, not a problem! It’s like Netflix was an art house cinema! Stream features, documentaries, and independent films with the Kanopy app on smartphones, tablets, and computers. They have a big selection of the Criterion Collection! This site provides you with training on software and web development, design, business, photography. These seem to be courses that can be finished between one hour to one day, and self paced. This well known language training is available through a link from the libraries site to their online language training site, with around 30 languages. Another language training software, with around 70 languages, including American Sign Language, Biblical Hebrew, Latin, and Shakespearean English. Another resource available is free tickets to several museums and cultural institutions. The line up of what is available changes on a day to day basis, and some are only available once a year. Most tickets allow you to take multiple adults and children. I’m most excited about getting tickets to California Academy of Sciences, Coit Tower, Contemporary Jewish Museum, de Young, Exploratorium, Legin on Honor, Pacific Pinball Museum, as well as trying out a few places I don’t know much about! – It seems that in addition to using these services on a device, you can read materials in a browser on a computer as well. – For the most part, you can check most things out for 3 weeks, and they will automatically return. So, NO LATE FEES! – For some items, the library only can let out a limited number of digital copies. – For items you need to renew, you can renew them if no one else is waiting for a copy of an item. – Each platform seems to let you check out about 20 items a month.